For the provisioning of SAP NetWeaver based products, Software Provisioning Manager is the mandatory tool to be used. As you may know the underlying executable running on the operating system is sapinst.exe on Windows or just sapinst on Linux. 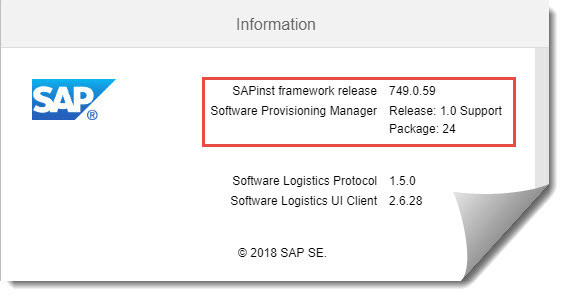 Software Provisioning Manager and SAPinst have an independent versioning. In some rare cases SAP support might advise you to download a newer SAPinst version and to replace it in the used Software Provisioning Manager. The next delivered Software Provisioning Manager version from SAP would also automatically include the new SAPinst version. Between those two tools there are dependencies and if SAP Support does not advise to replace SAPinst in your used Software Provisioning Manager, we do not recommend to do it proactively. In general, it is recommended to download and use the Software Provisioning Manager stack consistently, which includes the latest version of SAPinst. If you start with a new provisioning project, make sure you have the latest version of Software Provisioning Manager which will automatically have the latest features and fixes included. Only in case that SAP support recommends to download SAPinst separately, you should follow this advice.